Desirable center unit with wrap-a-round lanai. Great view, central location and easy access to Ala Moana Shopping, Park and many restaurants and Waikiki beaches. Wailana Coffee Shop located on ground level. Exercise room and heated pool. Remodeled kitchen with new flooring. Bedrooms and full bathrooms on each side of the living room for max. privacy. Walk in closets in both bedrooms. Vacant for immediate move in. 1 year lease preferred. 2 TV's one in kitchen/dining area and a new 55"TV in living room. New dining room furniture and dressers. The lanai is huge and wraps around the entire apartment. A nice feature with this building is that you are able to BBQ on your lanai with electric grille. 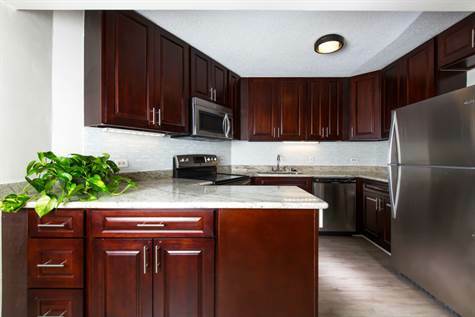 Unit Features: AC Central, Book Shelves, Cable TV, Dishwasher, Disposal, Drapes, Dryer, Kitchenware, Lanai, Linens, Microwave Hood, Refrigerator, Smoke Detector, Washer, also 2 storage lockers located just outside your front door on the same level.